“Four Tales from the Arabian Nights,” Plate 10. Marc Chagall (1887-1985) was a Russian-French modern artist of Jewish heritage. He synthesized movements such as Expressionism, Cubism and Fauvism. Unlike many European Jewish modernist artists, he explored explicitly Jewish themes. In the 1930s his works were banned in Germany as degenerate by the National Socialists. He barely escaped France for New York after it was occupied by the Nazis. For more on Chagall, see Perry J Greenbaum. 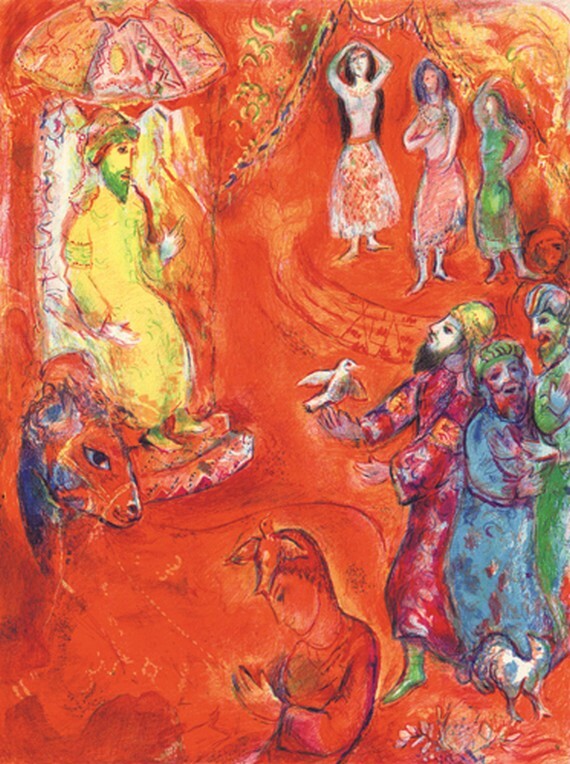 “Four Tales from the Arabian Nights” (1948) was Chagall’s first project in color lithography, and most of the 13 plates explored themes in love and loss (they were done soon after his wife died). Only 111 books were printed, and most were later broken up so that the lithographs could be sold separately.